Elizabeth K. (Champion) Baier "Betty"
1935: wait tables/wash dishes at bunkhouse/restaurant, worked for Bill Tallman for .50 a day washing diapers on washboard. Elizabeth K. "Betty" (Champion) Baier, formerly of the Black Hills area, died Friday, Feb. 29, 2008, at the Good Samaritan Center in Canistota, S.D., at the age of 90. She was one of 14 siblings. She grew up in Keystone, S.D. She worked in the kitchen at Mount Rushmore during her teenage years. She married Edmund G Baier (Birth: Feb. 10, 1916, Death: Sep. 12, 1996) on June 28, 1941, in Newcastle, Wyo. 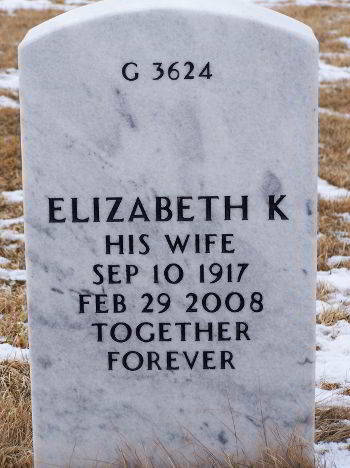 He preceded her in death on August 12, 1996. Survivors include one daughter, Beverly Fischer, Vermillion; three sons, James, Canistota, Terry, Garden Prairie, Ill., and Kelly, Denver; two sisters, Margaret Buntrock, Rapid City and Opal Warner, Minneapolis; three brothers, Paul Champion, Rapid City, Richard Champion, Oregon, and Arthur Champion, Minneapolis; 12 grandchildren; 30 great-grandchildren; and one great-great-grandchild. Services were held Tuesday, March 4, at Zion Lutheran Church in Canistota. Burial will be at Black Hills National Cemetery near Sturgis.